So we have a new Farm Bill if, as all signs suggest, the President signs the new legislation. The bill is estimated to cost $428 billion over the next 5 years and $867 over the next 10 years according to the Congressional Budget Office (CBO). Over 76% of the cost is estimated to be for the Nutrition title of the bill. CBO estimates the bill will spend about $1.5 billion more than continuing existing legislation. This is in contrast to the $23 billion cut in the last Farm Bill. The largest cut occurred in the Rural Development title by tighten some Rural Utility Services programs. The Miscellaneous title has the greatest increase among the various titles, and contained funding for an animal disease vaccine bank, funding for feral hog eradication and Beginning farmer assistance. Farmers will be allowed to switch between the Agriculture Risk Coverage and Price Loss Coverage programs starting in 2019 and again in 2021, 2022 and 2023. Payment limits remain at $125,000 and AGI limit at $900,000. Expands program payments to nieces, nephews, and cousins. Increased by substituting “transitional” T-yield of 80 percent of the county T-yield – up from 70 percent. The Conservation Stewardship Program (CSP) takes cuts to fund more EQIP which is increased by $275 million. Up to 1/2 of the money can be used for livestock operations. The Conservation Reserve Program (CRP) will be expanded from 24 million to 27 million acres, with 2 million acres reserved for grasslands. CRP payment rates will be capped to keep them below local rental rates. With a looming farm bill debate, crop insurance stands as the largest single component of the crop farm safety net. The program provides risk protection from low yield or revenue in return for a premium that producers pay. These premiums were subsidized by the USDA on average about 63% across all programs in 2016. The total cost of the subsidy in 2016 was approximately $5.85 Billion. 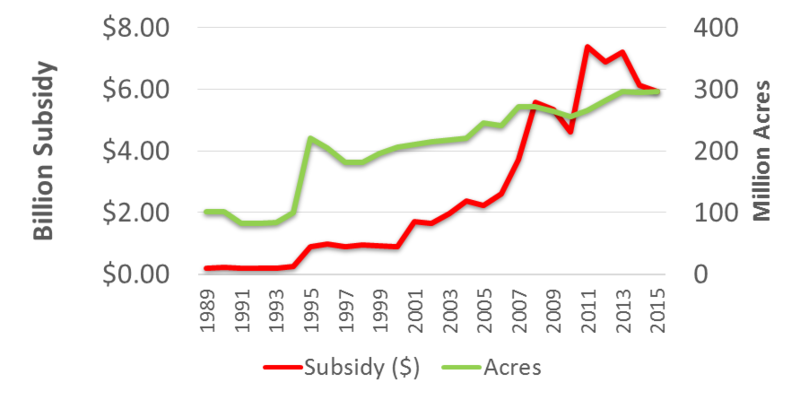 Figure 1 provides a bit of historical perspective on acres insured and total crop insurance subsidy. 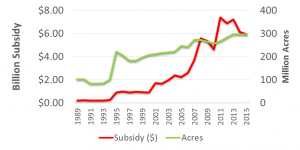 Beginning in the early 1990s a series of legislative changes increased subsidy levels and acreage insured has trended up as well. We note that recent declines in subsidy primarily result from reduced crop value as prices decline from historic highs. 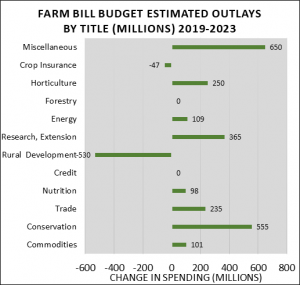 In the next farm bill debate the amount of subsidy for crop insurance is likely to be a topic of discussion. A frequent question posed to economist sounds something like this, “If we change the subsidy structure what will happen to crop insurance participation.” This question has been asked and answered numerous times. In most, but not all studies, the conclusion has been that crop insurance demand is inelastic. That is, the percent change in participation will be less than a percentage change in subsidy. However, many of those studies are older and may reflect a different era of crop insurance. In this report, we examine some key data associated with RMA corn and soybean program participation. We do not estimate an elasticity, but rather show evidence of a consistent pattern in in how much farmers are willing to pay for crop insurance. We use the dramatic changes in crop value between 2011 and 2016 and variation in riskiness across regions to show a remarkable constant in crop insurance demand. We find that across periods of high and low crop value and across regions of low and high risk – corn and soybean farmers are willing to pay out-of-pocket no more than four percent of the expected value of the crop. If this is true, it has implications for the demand for crop insurance when subsidy is changed. We do not provide a theoretical explanation for this finding but believe it may be tied to the degree of risk aversion and farmer budget constraints. We begin by examining variation across region in the base county premium rate. The maps in figure 2 and 3 show wide variation the level of yield risk across growing regions. While most producers purchase revenue insurance, regional variation in premium rates are largely driven by yield risk. Next we examine the amount of insurance chosen by corn and soybean producers. Figures 4 and 5 reflect the acre-weighted average coverage level chosen in each county. We use coverage level to represent the amount of insurance chosen by those who participate in the program. When figures 4 and 5 are compared to figures 2 and 3, a pattern begins to emerge. 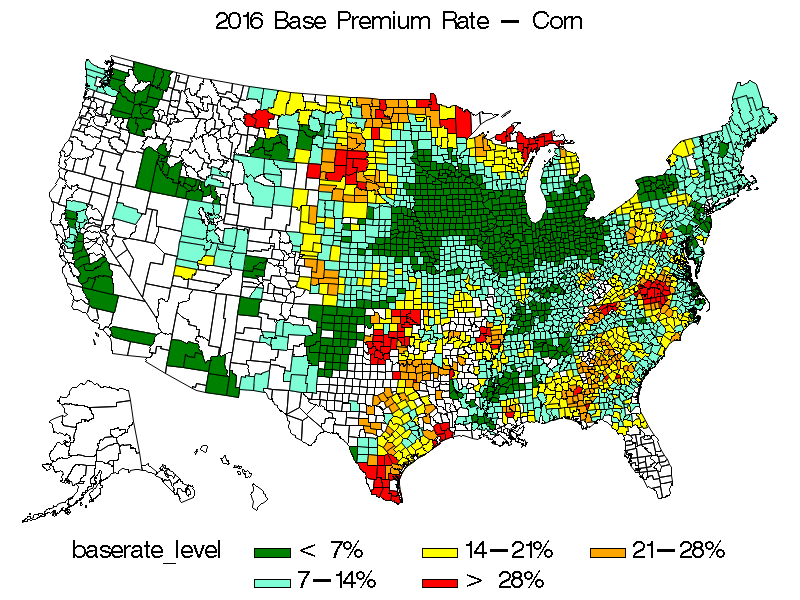 Areas of the country with lower per-acre base premium rates also tend to purchase higher coverage levels than areas with higher base premium rates. Figures 6 and 7 show the 2016 average producer paid premium per acre for corn and soybeans by county. Note that producer premium is a function of the coverage level, rate, and value of the crops. In general, low risk-high yield regions pay similar premiums per acre as higher risk-lower yielding regions. 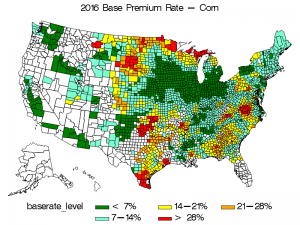 Having said that the lower coverage levels chosen in many higher risk regions results in lower producer paid premium per acre. Finally, the maps show that producer paid premium for soybeans are generally lower than for corn. This is in part due to lower per acre expected crop value. Figures 8 and 9 divides the average producer paid premium by the insured value of the crop to compute the percentage of expected crop value farmers opt to pay in producer paid premium. This reveals our primary finding. As can be seen in both figures, the majority of counties are shown to pay between one and four percent of the value the crop in 2016. Thus, we find that farmers appear to be willing to pay a premium of about four percent of crop value and no more. To test the robustness of our results in 2016 we also conduct the same analysis using data from 2011. These results are shown in figures 10 and 11. Note that higher crop price in 2011 resulted in expected crop revenue more than 30% higher in that year than in 2016. 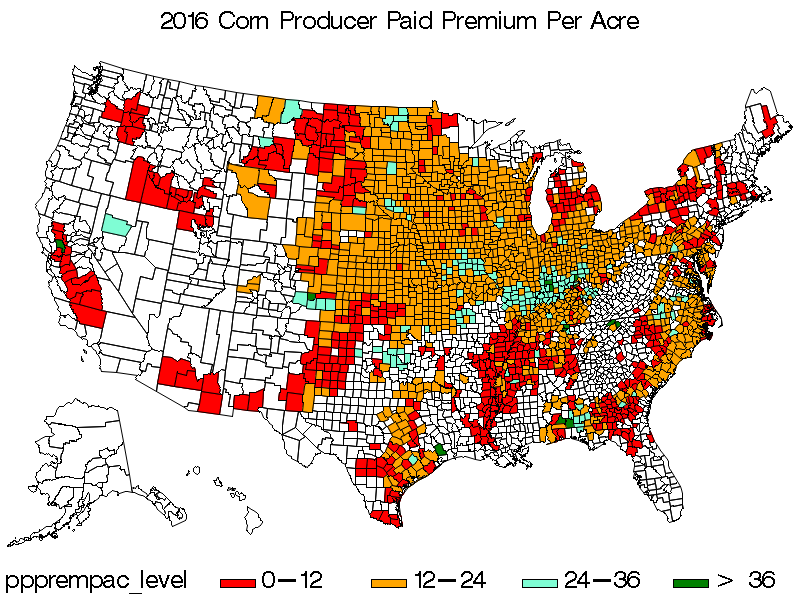 However the premium paid as a percent of crop value maps look quite similar to that of 2016. 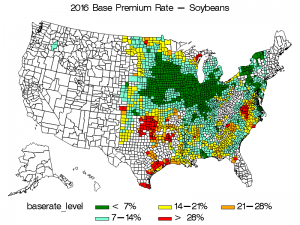 While we find quite robust results, it is not clear why producers seem to spend such a constant percent of crop value on crop insurance. Most likely it is related to the out of pocket cost associated with this program and the perceived benefits. We suggest that models of insurance demand consider the possibility of a budget constraint on crop insurance demand. Ultimately, the consistency of these results suggests that if crop insurance costs rose past four percent of expected crop value, the producers would reduce insurance expenditure – most likely by reducing coverage levels. Where have the Generic Acres Gone? Where will they go? As the cotton industry asks for a new Title I program in the next Farm Bill, the question of what becomes of generic base becomes a central issue. In this report, we summarize a USDA/FSA report summarizing the program crops to which generic base has been applied in 2015. Note that an acre of generic base applied to a program crop then receives the payments associated with that crop. Nationally 10.6 million acres of generic base were applied to program crops in 2015. 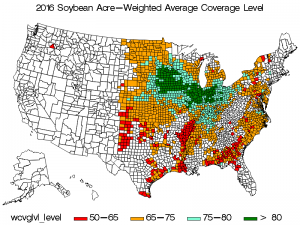 Of that total 33% were applied to soybean acres. However, the Mid-south pulled up the national average where over 60% of generic acres were applied to soybean acres. CALIFORNIA 276,897 51.9% . 27.8% 8.4% . . In Texas, the state with the most generic acres, wheat and grain sorghum captured the highest percentage of generic acres. Nationally wheat was the second highest percentage of generic acres pulled up by states like Oklahoma and California where almost 90% and 52% of generic acres went to wheat, respectively. Many have suggested generic base was moving to peanuts. Nationally, only 8.7% of generic base has moved to peanuts. However, that shift is more common in Southeastern states where peanuts are a larger player such as Alabama, South Carolina and especially Georgia where 59% on generic base went to cotton. 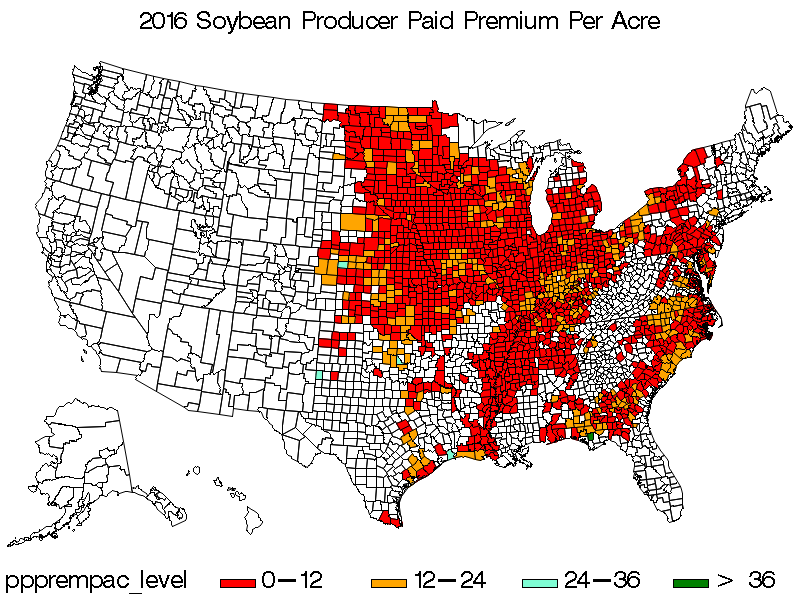 With projected declines in soybean and corn ARC payments in the future, perhaps these crops will become less attractive for generic base planting. With the cotton industry push for a cottonseed program, what will become of the generic base is a key question for the farm bill. Generic base was born of the ‘planted acre versus base acre’ debate during the last farm bill and will be integral to that conversation again. Multiple workshops related to the 2014 farm bill have been scheduled for December. These workshops are targeted at our numerous crop producers and will provide detailed information on the new ‘covered commodity’ programs (ARC & PLC), new crop insurance products (SCO & STAX), the available decision aids, and what this all means for farm risk management. At the conclusion of this series, if more workshops are needed please let us know and we will schedule them in January 2015. Please help us get the word out to as many impacted producers in the state. **Keith will provide similar details at the 2014 Row Crops Shortcourse, which overlaps with this date. We have been modeling crop insurance and farm policy for years. Tremendous advances have been made in quantifying agricultural risk. As farmers face decisions regarding their participation in federal farm programs and crop insurance various decision aides have been developed to evaluate alternatives. Based on our experience, here are five questions to ask anyone who tells you they have a decision aide for evaluating the ARC/PLC choice. How does the decision aide account for uncertain prices and yields over the life of the bill? Most spreadsheet aides are simply calculators, meaning they are ‘deterministic’ in that they calculate a payment based on the exact yields and prices provided. The problem, of course, is that one can’t possibly know with certainty what yields and prices will occur. How does the decision aid account for the likelihood of various prices and yields over the next 5 years when estimating payments? If the decision aid accounts for risk, what risks are modeled? There are five major unknown variables that must be accounted for in any crop insurance, ARC, and/or PLC decision aide. These are: three prices – cash prices, futures market prices, market year average prices, and two yields – farm and county yield. Does the decision aid account for the likelihood of different outcomes for all of these unknown variables? If the decision aide accounts for risk, then how is the correlation of random variables handled? These five unknown variables are not necessarily independent, meaning there is a relationship (or correlation) between them. In fact, there is good reason to believe that many of them are related. For example, farm and county yield are most likely positively correlated. In the Midwest, yield and price for corn likely have a negative relationship (as yield declines, corn price would increase). Cash, futures, and MYA price are likely positively correlated. Prices and yields across years are also often positively correlated (trends develop over time). There are more relationships, for example: a farm considering individual ARC with three crops potentially needs to account for 120 correlations. Modelling correlation is difficult, but very important and shouldn’t be avoided to accurately assess the farm program and crop insurance options. Does the model ask you for a lot of farm yield data? Nobel Prize winner Daniel Kahneman points out the problem of using only a few years of data to form expectations often provides faulty outcomes. Our research suggests that evaluations of farm-level crop insurance and farm program outcomes with less than ten years of farm yield data will be highly inaccurate. Does the decision aid help you understand risk protections as well as expected returns? 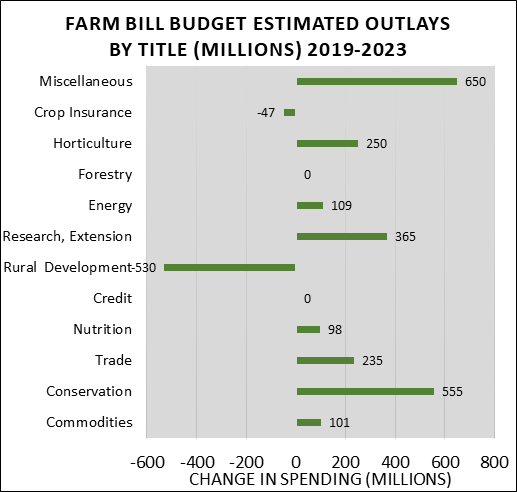 The new programs offered from the 2014 farm bill are intended to help farms reduce exposure to the risks of low price, low yield, or low revenue. Simply reporting the ‘deterministic’ expected payments – payments that come from one price and one yield – from the programs ignores the question of whether the payments help mitigate risk exposure. In other words, how does the farm program and crop insurance decision fit into the entire operation’s business portfolio? In summary, predicting the future is extremely difficult. However, methods to provide guidance with respect to the uncertainty and correlation amongst the multitude of possible outcomes do exist but are often difficult to apply. Some of these are built into the current offering of decision aids provided by Texas A&M and Illinois, but few are available in simple spreadsheets built by others. For example, the two spreadsheets we have provided (CLICK HERE) only give the base reallocation calculation and the calculation of how generic acres will be distributed based on a given number of planted acres, both of which are simple calculators. While these types of “decision aids” can be very useful, keep the questions we pose here in mind as you evaluate the results generated from them. The USDA has announced in a press conference Thursday morning that sign-ups for the new Dairy Margin Protection Program (MPP) will begin next week. Producers can begin signing up at their local FSA office beginning on September 2 and must sign up by November 28, 2014 to be covered for the 2015 production year. Future years will have a sign-up period from July 1 to September 30, and if the deadline is missed there will be no future opportunities to sign up for that year. One additional stipulation is that once a producer signs up, he/she will be enrolled until December 2018 when the program is set to end. The Margin Protection Program is a safety net program that pays out when the actual dairy margins fall below a producer selected coverage level and is open to all dairy operations, regardless of size. There is a $100 administration fee due upon sign-up, and producers can choose a coverage level that guarantees a margin of between $4.00/cwt and $8.00/cwt. Producers can also choose to cover between 25% and 90% of their production history. Producers can choose a coverage level annually during the sign-up period, and the premium payment is due upon signing up. When signing up for the first time, two forms must be filled out. One form will establish the farm’s production history, while the second form will establish the coverage level and the amount of production covered. Overall, the program appears to be a great, low-cost safety net for diary producers. Producers electing coverage for a $4.00 margin will pay only a $100 administration fee, with the premiums rising as coverage levels increase. The FSA has a very useful online resource to help producers select a coverage level at www.fsa.usda.gov/mpptool. An additional breakdown of what we knew about the MPP prior to Thursday morning’s press release can be found here. We will also be posting additional resources in the coming days to further break down the new Margin Protection Program and help producers determine the coverage level that will be best for them. The Supplemental Coverage Option (SCO), Stacked Income Protection Program (STAX) insurance and county Agricultural Risk Coverage (ARC) programs in the new farm bill are novel risk protection products. All three cover a band of shallow losses and leave the producer exposed to more severe losses unless otherwise protected by crop insurance or by some other means. Shallow loss programs are new, but most people understand the concept of layering risk protection. What is less clear is how well people can evaluate county- versus farm-triggered programs. County-triggered programs are not new. They have been around for decades in the form of area coverage insurance. This type of insurance is currently known as Area Risk Protection Insurance (ARPI) and was formerly called the Group Risk Plan (GRP) and Group Risk Income Protection (GRIP). ARPI is a county-triggered alternative to farm-triggered insurance whereas STAX, SCO, and ARC are supplements to farm-triggered insurance (e.g., Yield Protection and Revenue Protection). Over the years we have probably studied and evaluated area risk protection products as much as anybody. So here are a few pointers. For an area triggered program to exist, county yields must be estimated and reported. In the past ARPI programs have been based solely on NASS county yield estimates. A historical series is used to predict expected yield and an actual yield is necessary to determine actual yield (or revenue) shortfalls in the insured year. NASS does not report county yields for every commodity in every county. They are unlikely to report in counties where the commodity is grown on relatively few acres and/or where few farms produce the commodity. To increase the availability of STAX and SCO it is likely that RMA will, at least in some crops/areas, use aggregated yield reports from farm-triggered crop insurance policies to construct county yields. It is less clear what FSA will use for ARC calculations. The bottom line is no county yield equals no program. Risk protection from area products all depends on correlation. Correlation is a statistical concept that simply means, two variables are related to each other rather than independent. For area shallow loss programs, this may be translated to, “To what degree does county revenue go up (or down) when my farm revenue goes up (or down). What we find is that this relationship is driven by the farm-county yield relationship. Typically county yield and farm yield move up and down together, but not perfectly. Further we find wide differences across farms in the relationship between farm yield and county yield. Think of a farm using typical production practices on the predominant soil type in the center of a county versus a farm using an atypical practice on a less common soil type at the edge of the county. 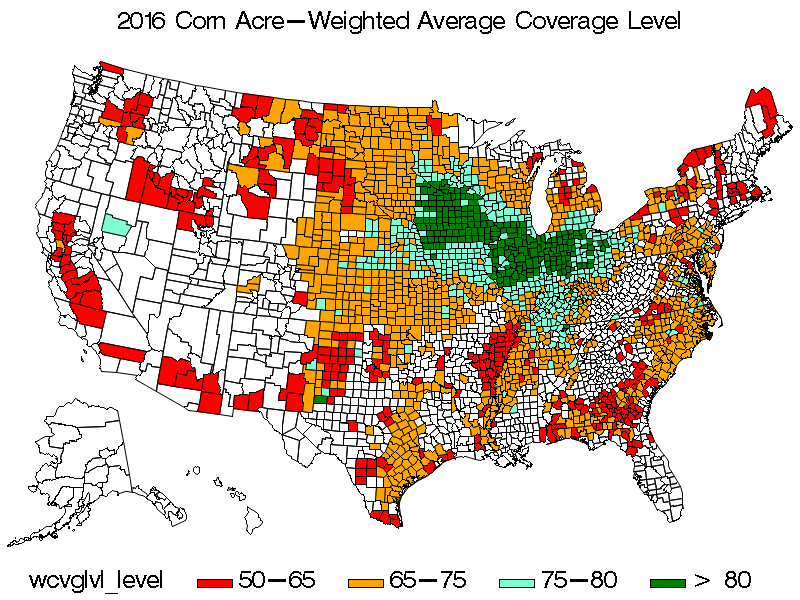 The correlation of farm-county yields will likely be less for the atypical farm and a county triggered program will provide poorer risk protection. Some have suggested that with the availability of county-triggered shallow loss products, growers should reduce the coverage level on their underlying farm-triggered insurance. Before making this decision growers should think very carefully about how correlated their yields are with the county yield. Likewise, a number of shallow loss “decision aids” are becoming available and more will likely follow. Growers should determine whether these decision aids allow for differences across farms in the correlation between farm yield and county yield. Ideally they would also help in measuring that correlation. Unfortunately, this is not that easy to do and many of the decision aids we have seen implicitly assume that farm-yield and county-yield are independent. Growers should be aware that any decision aid that does not adequately address correlation is likely to provide erroneous guidance on decisions about shallow loss programs. What is not very important is whether your average yield is higher or lower than the county average. With both farm-triggered crop insurance products and county-triggered shallow loss programs, payments occur when the realized percentage shortfall exceeds the percentage deductible. The percentage deductible is just 100% minus the coverage level (thus a crop insurance policy with a 75% coverage level has a 25% deductible). The percentage shortfall and percentage deductible are both calculated relative to the expected yield or revenue. For county-triggered programs it doesn’t really matter whether your excepted farm yield is higher or lower than the expected county yield. What matters is how closely the percentage shortfall on your farm matches with the percentage shortfall at the county level. If the county experiences a 25% revenue shortfall and your farm also experiences a 25% revenue shortfall then the county-triggered program should do a nice job of covering your losses. However, if your revenue falls 25% but the county revenue only falls 15% you will not be fully covered. County yields are less variable than the average variability of farms in the county. This is the result of the county yield being an average of all the farms in a county. Past research typically finds the average farm is about 30% riskier than the county in which it resides. What does this mean for STAX, SCO, and ARC? It means that, all else equal, a layer of county-triggered coverage will pay less than the same layer of farm-triggered coverage for the typical farm. This is actually the motivation behind the scale option in ARPI and STAX products. Get ready for differing USDA estimates of county yields. FSA, RMA, and NASS may each use different data and different procedures for estimating realized county yields. Thus, it is quite possible that these various USDA agencies will generate different estimates of the realized county yield in a given year and these different estimates will be used to determine payments for different programs. If that seems strange, know that the 2014 Farm Bill did not define how these county yields would be developed. Good luck to the USDA officials who have to explain the differences. The Supplemental Coverage Option (SCO) crop insurance endorsement will be available to winter wheat producers in Bolivar, Coahoma, Sunflower, Tallahatchie and Washington counties for 2015. SCO was authorized in the Agricultural Act of 2014 and will provide an indemnity payment when yield or market revenue (depending on whether the producer has a yield protection or revenue protection policy) measured at the county level falls below 86 percent of the expected county revenue as determined from county yield histories and futures prices. The SCO indemnity payment size is determined by the proportion of the range of the loss below 86 percent down to the nominal coverage level of the producer’s farm-level crop insurance. A producer will pay 35% of the actuarially-fair premium (65% subsidy) for SCO coverage. While the indemnity is triggered by county level production or revenue, the producer’s actual production history yield is used calculate both the SCO indemnity and SCO premium. Winter wheat producers in the five eligible counties will need to make SCO participation decisions by the September 30, 2014 sales closing date. Risk Management Agency will have the projected price for winter wheat available after September 14, 2014, at which time premiums will also be calculated. A producer is not required to purchase SCO coverage. SCO is not available for acreage enrolled in the Farm Service Agency’s (FSA) Agricultural Risk Coverage (ARC) program. For fall planted wheat for the 2015 crop year only, an insured who applies for SCO and later elects to participate in ARC for winter wheat has until the earlier of the acreage reporting date or December 15, 2014 for any fall-planted wheat with an acreage reporting date after December 15, 2014 to withdraw SCO coverage on winter wheat on the farm for which ARC was elected for winter wheat and owe no premium. This is a one-time exemption that will only be allowed for 2015 crop year for fall planted wheat, to recognize that the ARC program rules may not yet be available to the public (FCIC-18180). Producers who intend to plant winter wheat this fall in the five eligible counties are encouraged to contact their crop insurance agents regarding this important decision. With the recent passage of the 2014 Agricultural Act a number of new choices are available for producers, while many of the previous options are no longer available. 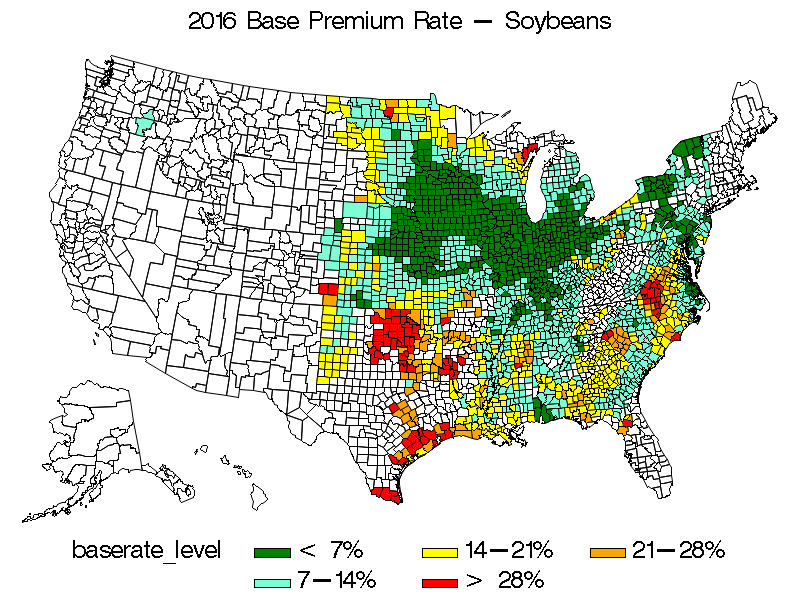 The analysis here examines these choices for soybean production in Mississippi. The report can be viewed at this LINK (Adobe Reader required to view the report). The Agricultural Act of 2014 introduces three county-triggered shallow loss programs – Supplemental Coverage Option (SCO), Stacked Income Protection Program (STAX) for cotton, and the county triggered version of Agricultural Risk Coverage (ARC). All three programs have the potential to be used as a risk management substitute for individual coverage crop insurance. However, it is important to note that aggregate county revenue is less variable than the average farm in that county. This largely stems from less than perfect correlation of yields within the county. The bottom line when one evaluates a county-triggered program versus and farm-triggered program, one needs to recognize (1) county-based programs will usually trigger less frequently and pay less indemnity than an identical layer of farm level coverage, and (2) county-based programs are not perfectly correlated with farm losses because farm and county yields do not rise and fall in perfect lockstep with each other. 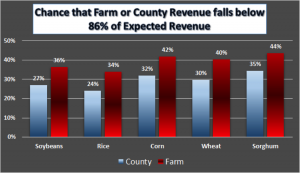 The following chart focuses on the first issue – county revenue tends to be less variable than farm revenue for a commodity. Computer simulations of farm and county revenue risk for hundreds of counties were conducted to determine the frequency that farm revenue and county revenue fall below 86% of expected revenue (the trigger point for ARC and SCO). The results are averaged by each of five crops. While there is variation within the data, county-triggered programs are about 10% less likely to trigger than a typical farm in the county, and all else equal, pay less than the same layer of crop insurance protection. The exception to this will be when the farm is significantly less risky than the county average. For example an irrigated farm in a mostly non-irrigated county.